Sting the pop song-spinner extraordinaire has left the building. Sting the complex storyteller is here instead, and here he brings a story worth listening to. With the release of The Last Ship, many fans may wonder if Sting the pop singer has returned. The answer comes quickly with a resounding “No, but I haven’t forgotten all I learned while I wore that hat.” Since Sacred Love, Sting has worn many hats -- but ever since then, he has strayed far from the mantle of Sting the pop singer. Whether it was the cerebral, brooding holiday album he released with If on a Winter’s Night or the Dowland reworkings assisted by Edin Karamazov, his body of work was varied and interesting indeed, if not as accessible as previously. There is a layer of accessibility that comes back on this release, as this album plays out like a long-after-the-fact sequel or companion piece to Sting’s underrated 1991 work, The Soul Cages. Listeners looking for soaring classics like “If I Ever Lose my Faith in You” might be disappointed -- but that disappointment gives way to a rich reward for those willing to look. As musicals go, this one has its upbeat moments -- even if they are often shot through with a sense of gloom, which is to be expected, considering the subject matter. While The Soul Cages was a moving elegy to his father and a brief touchpoint on the struggles of being a shipbuilder in Britain as the industry began to decline, this album takes those touchpoints and blows them wide open. Not surprisingly, it does this with muted, relaxed tones -- all the while staying grounded in folk music. Given the sounds he dabbled with on Songs of the Labyrinth, it is possible to see that album as a practice run for this disc -- even if it is less lute-centric. Opening up with the title track, snatches of uilleann pipes dart into view, then back out again, painting an eerie picture of a spirit locked in an endless cycle -- hard labor is done, a new ship is built, it sails away, and the cycle starts again. Some have panned the thick brogue he adopts on this track -- but truthfully, it’s nice to hear Sting emote with his voice in a manner outside of his comfort zone. Even though his pop albums may have featured skillful singing, at times he sounded too much the same from album to album. Oddly enough, the lush yet ethereal instrumentation calls to mind the style from two of Sting’s past works -- once more a throwback to The Soul Cages, but bearing the still-more-funereal vibe of his less-successful Mercury Falling. This is the sort of fusion that only works if done well, and here it most definitely is. As a fine stage-setter, the more stripped-down “Dead Man’s Boots” is equal parts father urging his son to take up the family calling and a son deciding to say the hell with it all. It’s one of the more harsh moments to be had in this story, but it’s a natural moment in this sort of story, and Sting sells it with a flourish not often heard when putting such thoughts to music. The narrative skips ahead a bit jarringly on the third track; “And Then” and its ode to the free-wandering-spirit kind of life can clash at times with old-school Sting musings of “Why would she wait for me?” -- a feeling that sets in during the latter half of the album with tracks like “I Love Her But She Loves Someone Else". In songs like these, we not only get to hear about the actions of the wandering spirit, we get to hear the consequences as well -- a combination which makes for a far more complete picture -- and coming as it does in the second half of the album, it flows more naturally with the story -- at least as can be discerned by the disc. The play itself may yet spin this piece of the tale more naturally -- which is difficult to say absent a viewing. Such latter-half regret seems a bit surprising to the ear, considering the “Wandering spirit finds his clever side” ramble of “The Night the Pugilist Learned to Dance”. It suggests very much a glimpse of the protagonist learning some valuable lessons in courtship, and yet those lessons seem learned too late later on in the course of the story -- too late to make the “Practical arrangement” Sting sings of midway through work, certainly. Tracks like these might suggest a bit of fleeting happiness, but all that happiness ends up dashed in the end. Elsewhere, there are pleasant sounds of quiet reflection in the protagonist’s journeys like “August Winds” and “Ballad of the Great Eastern”; the latter is the track that most nakedly recalls the sound, mood and tone of “The Soul Cages". This quiet reflection gives way to what is sure to be one of the stage show’s rousing set pieces, “What Have We Got?”, which finds Sting in traditional Irish-stomper mode -- definitely a long way from his comfort zone of echoing, atmospheric soundscapes, but one that suits the story -- and the rest of the album -- quite well. It plays neatly to the fatalistic bent of the story -- offering a cornucopia of details of life working in the shipyards, a few of them very pleasant, but at the same time bringing a firm sense of “Well, it’s a life.” Plus, when the music is this upbeat, it sends off a strong message of learning to make the best of what you have, even if what you have isn’t the most appealing thing to the untrained ears and eyes. 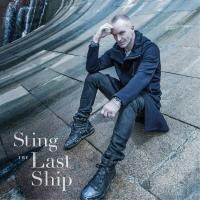 Sting the pop singer is clearly not returning any time soon -- but for better or worse, he manages to shine onThe Last Ship. It is an ode to simpler times, an homage to his family history -- and indeed, the history of shipbuilders in general. More importantly, it manages to take all he has learned since his days in the Police, and spins a tale that is by turns riveting, exciting, and heart-wrenchingly sad -- but given the source of this material, also unflinchingly real. If Sting the pop star is something the music world will never see again, then the newly and unflinchingly honest tone to his music is a fine thing to experience in the here and now.